Data center nowadays are migrating to high-bandwidth, high-density network infrastructure. This increased network speeds have tighter link budget requirements that can be challenging to achieve with field terminations. 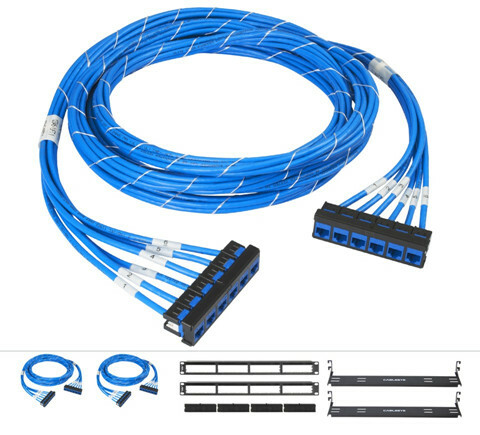 Pre-terminated cabling includes a variety of trunk cables, array cables, and plug and play cassettes that gives data center managers options that suit specific needs. Besides this, there are several reasons to consider pre-terminated optical fiber in data center solution. The following image shows the pre-terminated UTP cassettes. With pre-terminated cable assemblies, transmission testing of assemblies is performed by the manufacturer before shipment, and test reports are included with the assemblies. This leaves only continuity testing for copper and 10% insertion loss and continuity testing for fiber, which reduces the time spent testing on-site. With pre-terminated solutions, data center managers can make changes quickly based on network growth, business decisions, or shifting requirements. In disaster recovery situations that call for fast, temporary data communications set-up, pre-terminated cabling can minimize business downtime and establish communications quickly. It can also be disassembled quickly when the situation is resolved. The components are reusable for more efficient moves, adds, and changes (MACs). Field termination is the most time-consuming, labor-intensive part of the cable installation process. Once pre-terminated cabling is delivered, it can be unpacked, readied for deployment, and connected quickly. In many cases pre-terminated cabling can cut installation time by up to 80% over field terminations. Additionally, precision factory-termination processes take place in a clean, well-lit environment, unlike termination in uncontrolled field conditions. This increases the likelihood of clean and uncontaminated optical fiber ports, enables lower loss budgets, and provides overall better electrical transmission. Factory terminations are also guaranteed under warranty, which offer data center managers peace of mind. Pre-terminated solutions allow for quick clean-up due to minimal leftover materials and scrap. Also, because there is less waste and material to clean up, pre-terminated solutions also help meet green design, waste reduction, and material reuse goals. Additionally, pre-terminated solutions provide an easy way for network managers to proceed a routine check. If you are making up your mind to deploy a pre-terminated system, one thing you shouldn’t miss is that the planning process typically requires more time upfront and more detailed analysis to determine specific cabling and termination routes along the cable trays and within the cabinets. Once the detailed plan is formulated and approved, the system’s cabling and connectivity components are manufactured and tested at the factory to ensure they meet all applicable industry standards prior to delivery. The next part will go on to talk about the how to select the suitable pre-terminated solution. Pre-terminated cabling solutions are ideally suited for data center environments where the cable routes are well defined and where the time for deployment, ease of installation, network reliability and manageability are paramount. When selecting pre-terminated cable assemblies, be sure to use a reliable provider that can offer services such as guaranteed cabling performance, design assistance, certified contractor training, and the ability to support large quantities of assemblies in the required delivery window. Make sure the pre-terminated copper or optical fiber purchased through a manufacturer uses components that have been tested and verified by a third party to exceed TIA and IEEE standards. The manufacturer should also provide 100% testing in a quality-controlled environment before the cabling is shipped out to the worksite. Pre-terminated cables are the plug-and-play solution for links between switches, servers, and patch panels in the data center. As the computing environments and business needs of organizations differ widely, not every enterprise will find the benefits of pre-terminated systems outweigh the investment. Field-terminated copper and fiber cabling and connectivity systems are generally less costly to purchase in terms of the various components. Just to find a suitable solution system for your own network. Providing reliable quality, advanced testing system and favorable price, progress of FS.COM has never stopped. We offer a variety of pre-terminated optics including the breakout patch cable, pre-terminated trunk cable and adapter panels. Fiber optic cables like SC fiber patch cable and LC to LC patch cord are also needed. If you have any requirement of our products, please send your request to us. ← Why Choose to Use a Managed Ethernet Switch?